Today we stay out in west Knoxville in our search of sushi, taking a look at a new place: Sobu. It's out on Kingston Pike just past Northshore Dr. Formerly Tao, the restaurant has shifted its attention from Asian fusion to being primarily a sushi restaurant. I'm here to tell you- the results are good. A few weeks ago Alice and I actually ventured out of downtown just to go to this place. We weren't disappointed. The first thing you notice is the "Asian chic" nightclub-like atmosphere. Sobu is not your typical Knoxville restaurant. A wall of bamboo separates the dining room from the bar area, and Buddha himself presides over the extensive liquor selection. The lighting is dim punctuated by bright pink and teal lights. This is not Nama's easy-going chic or Tomo's dive-ish intimacy. Sobu really wants to be cool, and I'm mostly OK with that. Call it Sapphire's big brother in Bearden. Definitely sit in a booth on the bar side of the restaurant for the best dining experience. The service was great. No waiting for 45 minutes to eat at Sobu. The place is big enough to accommodate quite a crowd, so chances are you'll get seated quickly. The drinks came out immediately and rolls were delivered promptly. Our waiter kept saying "For the lady..." whenever he served Alice, which was a little creepy, but I think he was just trying for a big tip. I have no problem with waiters falling all over themselves to make sure you have a good experience. I won't tell you about their amazing secret menu, because I don't even know if they have one. I believe best litmus test for a sushi place is their eel and avocado maki roll. On this test Sobu scored upper mid level to high: the presentation was good and the sauce just right, but the eel itself was slightly chewy. The seaweed paper didn't seem very fresh. Overall, I would place the sushi quality just below Nama's rolls, but above most of what I've tried in Knoxville. The prices are way below Nama's inflated level, which tips the value to quality ratio in favor of Sobu. Em has informed me of a "hot roll" (it's called something else) that has jalapeno peppers in it. Sounds interesting! It may be that Sobu's signature rolls would be the way to go. I'll definitely try it next time. 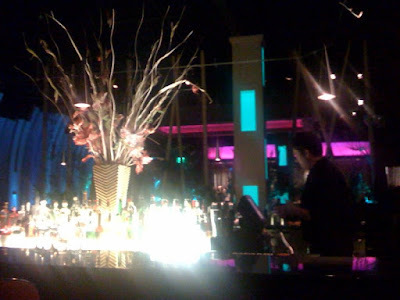 Sobu is for you if you're wanting good, well-priced sushi, good service, and a chic atmosphere to dine in. I wish I could remember the name of that "hot roll," but I just can't. They also have a very good tropical-ish roll with cream cheese. I am normally anti-cream cheese when it comes to sushi, but this one is really good. BTW, A huge pet peeve of mine is when restaurants don't have websites!! Subo doesn't (if you google them, 4 or 5 hits down is a link to their myspace page, but who the heck uses myspace anymore, and it's a crappy page anyway). Tomo hasn't had a website either (boooo!) but it looks like they own a domain and have something under construction (yay!). Put your menus online, people!! The no-wait bit is what I always loved about Tao, so I'm glad that's still the case. The American Dream roll from Sobu is my absolute favorite sushi roll. Hands down. I love Nama in general, and their sushi definitely rains supreme in Knoxville, but you have to try this roll next time you are at Sobu. It consists of a tempura shrimp roll, accompanied by some delicious spicy lobster sauce. I am actually salivating as I type this. It's that good. p.s. I totally agree with Em. Online menus are a must! I went to Sobu on Friday before heading out of town for the weekend and can now remember the name of that "hot roll" I told CK about. It's the Flame Roll, and it is fabulous (I ate one on Friday). The roll with cream cheese and mango...I told myself to remember the darn name and I forgot it. It's equally as good as the flame roll, though, and you should be able to identify it on the menu by those two ingredients. btw, have you guys ever tried the sushi at Kalamata Cafe? http://www.volunteertv.com/cleanitup/headlines/44073297.html"Sobu Restaurant on Kingston Pike scored 54. This inspection was conducted due to a complaint filed by the state. - Inspectors forced Sobu to throw out four containers of whipped cream, one gallon of milk, 87 eggs, A 10 pound box of cream cheese, 216 ounces of tofu, six pounds of applesauce, and seven quarts of creamer that was all stored at hazardous temperatures."